With the development of the Southern Gas Corridor (SGC), Europe’s energy security will be ensured on a wider scale, Azerbaijani Energy Minister Parviz Shahbazov said, Trend reports with reference to the Energy Ministry. He made the remarks at a meeting dedicated to energy security issues as part of the 55th Munich Security Conference in Germany. In his speech, the minister spoke on the growing role of energy security in ensuring global security, energy policy, oil and gas projects of Azerbaijan that serve to the regional and global energy security, as well as sustainable development. The minister stressed that the implementation of the SGC project being carried out with the participation of seven countries and numerous companies, entered the final stage, and informed about the strategic importance of the project recreating the energy map of the world. The SGC is the first real project representing diversification on each of the sources and each route in the global energy security system, he said. Despite that this project is aimed at the South-Eastern Europe market, which is considered a vulnerable region in terms of energy security, it has the prospect of greater coverage of the European market in the future, he noted. The minister also informed about the fifth ministerial meeting as part of the SGC Advisory Council to be held in Baku Feb. 20, and about the contribution of the discussions of this format to energy security. 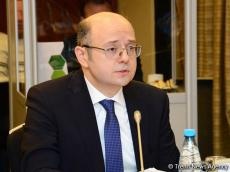 The SGC is one of the priority projects for the EU and envisages the transportation of 10 billion cubic meters of Azerbaijani gas from the Caspian region through Georgia and Turkey to Europe.